Aviary Cafe has been at the top of my brunch bucket list for years now. I remember walking by this airy little downtown cafe back when I lived in Springfield (10 years ago, sheesh) and always wanting to pop in! Well a couple of weeks ago I was in the area for my cousin's wedding and thought it was high time that I stopped by. I called up my Aunt Carolyn and cousin, Christina, then braved the cold for a snowy Monday brunch. I have to first say that the service was really great. It was by no means a busy time to be there but our sever was attentive, patient, and accommodating. We really appreciated her! Aviary Cafe's big draw is their crepes. They have savory options, sweet options, and even gluten-free options. The gluten-free aspect was really important to us as both my aunt and cousin have Celiac Disease. Unfortunately the day we came in the cafe was out of gluten-free flour which meant no gluten-free crepes for us; however, they did their best to be accommodating and offered their savory crepes on the menu as gluten-free omelets instead. We just looked at the situation as reason to come back and try their crepes again! 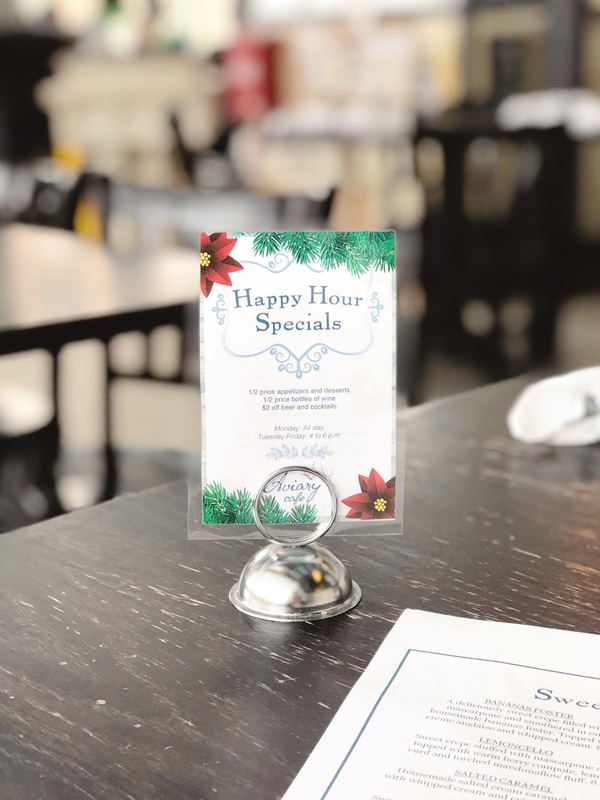 To our surprise, Aviary Cafe offers happy hour all day on Monday (as well as Tuesday - Friday from 4 - 6 pm). This meant half price appetizers and desserts, 1/2 price bottles of wine, and $2 off beer and cocktails. What a great way to start the week! Fried crispy then tossed in olive oil, garlic, and lemon. Topped with pickled onions. Scrambled eggs and cheddar jack with your choice of ham, bacon, or sausage. Rolled in a sweet crepe and served with a side of syrup. Spring mix topped with apples, chevre, house made croutons, and pine nuts, Dressed with apple rosemary balsamic vinaigrette. Sweet crepe stuffed with mascarpone and topped with warm berry compote, lemon curd, and torched marshmallow fluff. The sweet crepes were classified as dessert just FYI which means we got them half off during happy hour. Yay for us! Everything was absolutely delicious and I would definitely recommend everything we had as being worthy of ordering. Our server told us that The Farmer is the most popular savory crepe option and the Lemoncello is a favorite among the sweet crepe selection. I cannot say enough good things about those Lemoncello crepes! They were honestly one of the most delicious things I've ever eaten in my life and surprisingly weren't cloyingly sweet. I think the lemon balanced them out really well! 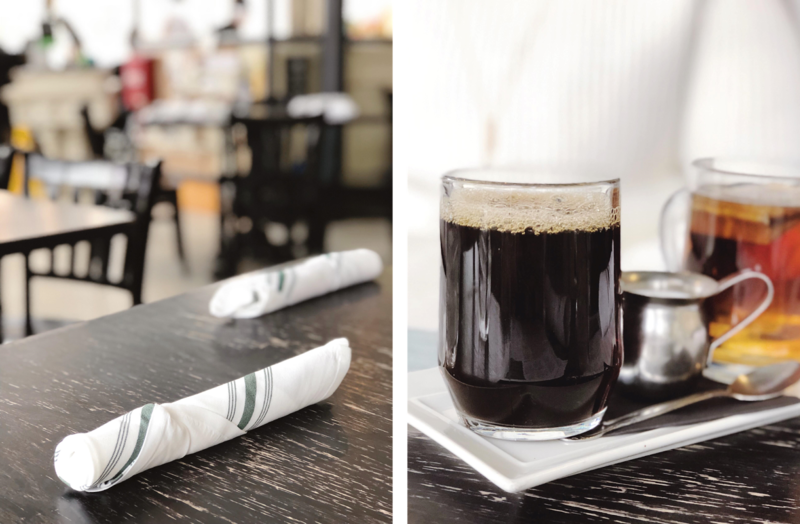 After our delicious experience it was really no surprise when I heard Aviary Cafe was voted 2017 Best Springfield Restaurant and 2018 Best Brunch by 417 Magazine Readers. I'd vote for them too! Oh, and one last detail I loved. 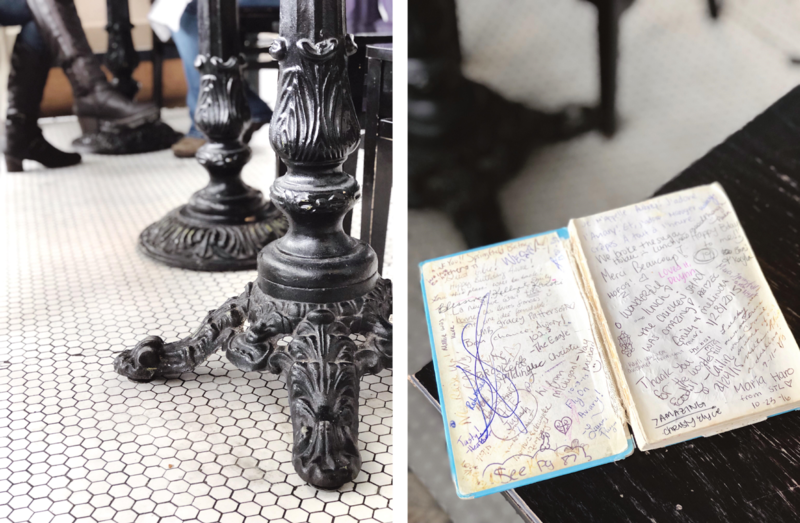 At Aviary Cafe your check comes out in a book that has notes from other guests who have visited over the years. How clever is that? Have you ever been to Aviary Cafe before? If so, did you try anything different? Haven't been to Aviary but have a favorite brunch spot of your own? I want to hear about that too - spill it all in the comments!